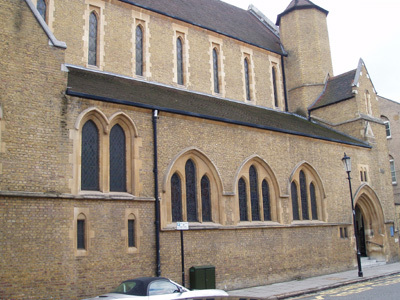 The church: St Mary's, Cadogan Street, Chelsea, London. 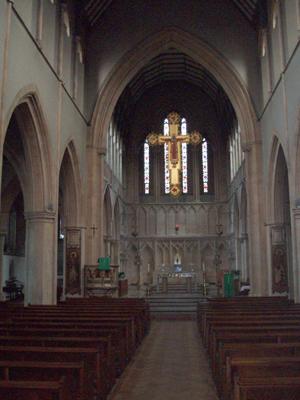 The building: The church is Victorian Gothic with many of its original fixtures and fittings. It has a very beautiful Lady altar with a gilded Gothic canopy and a very attractive Christus Rex hanging over the high altar. The church: This church is situated in one of the most prestigious boroughs (Chelsea) in London and along with the Brompton Oratory and Farm Street (the Church of the Immaculate Conception in Mayfair) is used by the "smart set"! The cast: Three priests, one member of the Knights of Malta and accompanying acolytes. The date & time: Saturday August 12th 2006, 12.00am. High mass according to the tridentine rite, on the feast of St Clare. This was a bit strange, since St Clare's feast is third class, and high masses are usually only for first class feasts and Sundays. This is is an annual tridentine mass organised by members of the parish, with their regular Sunday Latin mass choir. It was an "eyes front, no looking round" sort of service, but I would say it was at least half full (80ish people). I think this was a reasonably good attendance, considering that the mass, to my knowledge, was only published on the LMS website. No, but only because I arrived early to get my missal, so I would know who was doing what and when. The usual Victorian oak pews: not uncomfortable and good for deportment. Extremely quiet and very reverential. People were praying or reading their missals. Dilexisti Justitiam et odisti iniquitatem, sung as the introit by the excellent choir. I think (although I couldn't hear him) that the priest started the service with In nomine Patris, et Filii, et Spiritus Sancti. The Daily Missal according to the rite of 1962, and the leaflets with excerpts from this. There were some charming little French girls who kept asking their mother difficult theological questions (of the type only four year-olds can dream up) in stage whispers, as well as jumping up and down on the kneeler. Considering the non-child-friendly nature of high mass, they behaved angelically! Stiff-upper-lip mantilla-wearing Latin, like you have never seen before. Even the readings were in Latin. The congregation in a tridentine mass follows in the missal and "silently prays" the mass. There are books, now largely out of print, which give appropriate prayers and mental dispositions for each part of the service. All we had to do was to know when to kneel, cross ourselves or stand, which for the uninitiated was trickier than it looked. It was very easy to lose your place, especially when the Priest was inaudible, which made it like trying to decipher a conversation where you have the full script but can only hear half of it. This being a Saturday and a third class feast, there was no sermon. We were treated to beautiful singing throughout, from the choir. Also heavenly was the prayerful reverence that characterised the mass for beginning to end. The poker faces! While people shouldn't be perpetually wreathed in smiles, neither should they scowl like gargoyles. As the service was outside the normal parish timetable, there was no post-mass coffee. 9  If St Mary's had a regular tridentine high mass, I would definitely attend. In this case, I think the question could be better phrased as: "Would you be persuaded to regularly go to tridentine mass?" My answer would be yes! It made me glad to be a Catholic Christian and to have such a rich, ancient and varied tradition to draw on. The choir and the super vestments.